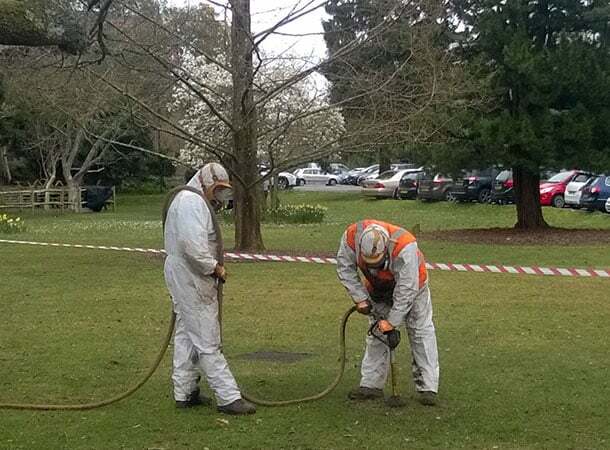 Visitors to Appletree Court, NFDC’s main offices in Lyndhurst, may have seen an odd sight last week (21 March 2019) when strangely dressed tree contractors were poking holes and injecting air into the lawn as part of work to save an Atlas cedar tree. 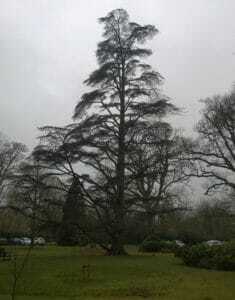 “Compaction of the soil is overwhelmingly likely to be the major factor in the tree’s decline. As the soil is compacted by either vehicles or just years of pedestrian footfall, the soil particles are squeezed closer together, squeezing out any air, which creates a hostile environment for root growth, as they need air to function. After confirming the tree’s stability and safety, the Council’s arboriculturalists decided to take action to reverse the tree’s declining health and use de-compaction of the root-zone, “This is the single best method to improving a tree’s health. For this work, an ‘air-spade’ was connected to a high powered compressor that forces air through the lance, creating a supersonic stream to penetrate and break up hard soils. The only evidence this work has taken place is small holes in the lawn, which will soon be reseeded.